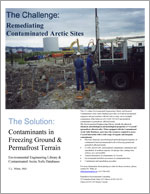 Permafrost Environmental Consulting (PEC) specializes in finding solutions to the environmental and geotechnical challenges presented by cold regions. Its president, Thomas L. White, PhD, brings over 40 years of extensive geotechnical experience in the laboratory and field, and in academic and government milieus to the company. Dr. White—formerly with the National Research Council of Canada (Geotechnical Section Permafrost Group, Division of Building Research) and former director of the Geotechnical Science Laboratories, Carleton University—and his associates have managed projects at local, national and international levels. These projects include designing and monitoring pipelines in permafrost, analyzing frost action on roads and foundations, studying the behaviour of contaminants in permafrost, and studying the effects of climatic change on infrastructure in cold regions. PEC continues to build on its many studies and investigations by providing its clients with cost-effective environmental and geotechnical monitoring and management solutions and innovations. © 2019 Permafrost Environmental Consulting Inc.